I’m Coach Kristi, a USAT Certified Triathlon Coach and RRCA Certified Running Coach. As a coach, I hear over and over from my athletes how difficult it is for them to stay motivated meeting their fitness goals when they’re interrupted by that occasional joint pain. That’s why I love IdealLean Glucosamine. It supports your body’s joint health, because when you exercise or perform even mild physical activity, your joint cartilage can experience inflammation as a result, which can translate to soreness. Glucosamine helps ease those unwanted side effects — like inflammation from exercise, or post-workout aches and pains, by supporting healthy cartilage and connective tissue. Having healthy cartilage is so important for you, because without its pliant and protective cushioning, your joints can’t maintain their healthy structure, which means you aren’t getting the most out of your workouts. 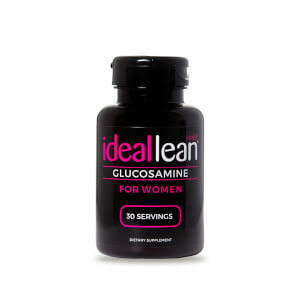 WHY SHOULD I USE IDEALLEAN GLUCOSAMINE? Your fitness journey will have its ups and downs, but experiencing physical pain while trying to achieve change shouldn’t be apart of it. Whether you’re an ex-athlete or just beginning to exercise for the first real time, Glucosamine will help support the functioning of your joints. 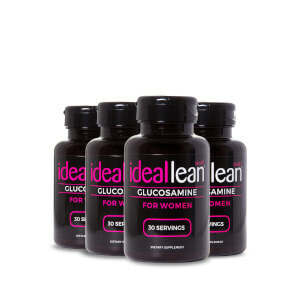 IdealLean’s Glucosamine contains glucosamine sulfate, which is the most effective form. 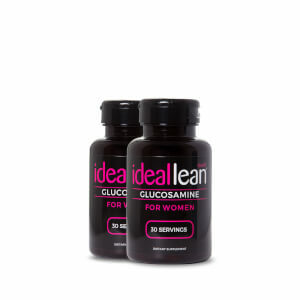 When you take IdealLean’s Glucosamine for women, you’re getting the best results. Just like the Tin Man, your joints need oil, and IdealLean Glucosamine supplements will provide your joints with the TLC they need so you’ll be ready for change. Can I view IdealLean Glucosamine nutrition facts? Other Ingredients: Veggie Capsules, Magnesium Stearate, Stearic Acid, Silicon Dioxide. Why is it called Glucosamine Sulfate Sodium Chloride? Studies show when sulfate is bound to glucosamine it is more effective in collagen reproduction and joint repair. What are the benefits of Glucosamine? Glucosamine helps prevent cushioning in the joints from being broken down, and can aid in the healing of damaged joints. How many pills should I take per day? Suggested use is one serving of two pills. When is the best time to take Glucosamine? Any time of the day will work. Take with food. Do I need to cycle off of glucosamine? The longer it is taken the more beneficial it will be for your joints. Yes, this product has been tested gluten-free. If I take more than the recommended dose will it help my joints to feel better faster? 1500 mg is considered the optimum dose giving full benefits. Does this product have shellfish in it? Glucosamine comes from the shells in shellfish and therefore if you have a shellfish allergy we advise against taking it. Do I need to take chondroitin with this product in order to feel the benefits? No. Glucosamine is a scientifically proven product for joint health on its own. How quickly will I notice an improvement in my joints? This is different for everyone. Studies proving the effectiveness of glucosamine have been done for time periods as short as 4 weeks and people can see improvements for 3 years +. How many days a week should I take this supplement? Take the recommended serving once daily. How many pills are in each bottle? Am I able to take this supplement with other IdealLean products? Yes. All products we produce can be taken together to improve results.